Temple University Press, Philadelphia, hardcover in cloth with sewn binding and with printed dust jacket, about 16.5 by 25 cm (6½ by 10 inches), 567 pages, including 84 colored digitally restored plates from the original 1810 to 1811 magazines and digitally restored text. George Perry, an English naturalist, published a magazine in 22 parts between 1810 and 1811 which he called the "Arcana" or the Museum of Nature. Very few copies of these publications exist now, the author says that only 13 complete sets are known today. These publications are now brought back to life, compiled and collated in this remarkable book. 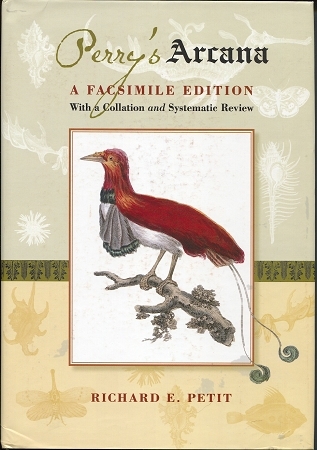 There is a well written forward by Paul Callomon of the Philadelphia Academy of Natural Science (who also did the digital restorations) and an excellent introduction to the work and its history by Richard Petit, a leading scholar malacological history and biography. The remainder of the book is the restored issues of this magazine, over 300 pages of descriptions of strange animals of all kinds, travels and the introduction of animals that were previously unknown to science at the time. It is fascinating reading Not surprisingly, since Perry work and field of study was conchology, the work for which he is most remembered for is "Conchology" one of the most important books in the history of that field. An up to date account of the species in the original publication is given in this book to give us the names that we are familiar with today. Do not confuse this book with the cheap "on demand" books on natural history that are available today. This book is a top quality reproduction.